How to activate progress claim, issue Variation Order, re-measurement, create Material On Site & etc. 1. Make sure your imported project is ready to make claim. 2. Clcik at "Publish To Tender" icon at the top. 3. The project now will move to "Tendering" module. 4. Click at "Tendering" module and double click to open the project. 5. Click at "Push To Post Contract" icon. 6. 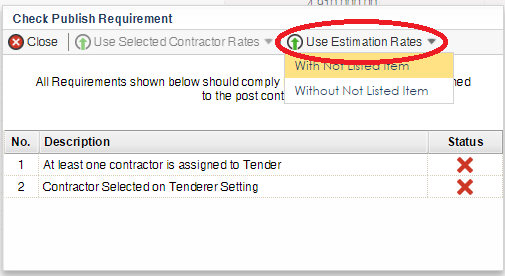 Click at "Use Estimation Rates" and select either with or without not listed item.